Now that the midterm elections are out of the way, it’s time to start thinking about the 2020 presidential election and what it could mean for the markets. Just kidding. With apologies to those still trying to recover from acute cases of election poisoning, it must be noted that last week’s market action appeared to be driven in large part by the midterms, with the takeaway being the US stock market likes a divided congress. Stocks followed up on their October 20–November 2 rebound with a second-consecutive up week, with strong gains on Tuesday and especially Wednesday as Democrats regained control of the House while Republicans solidified their hold on the Senate. 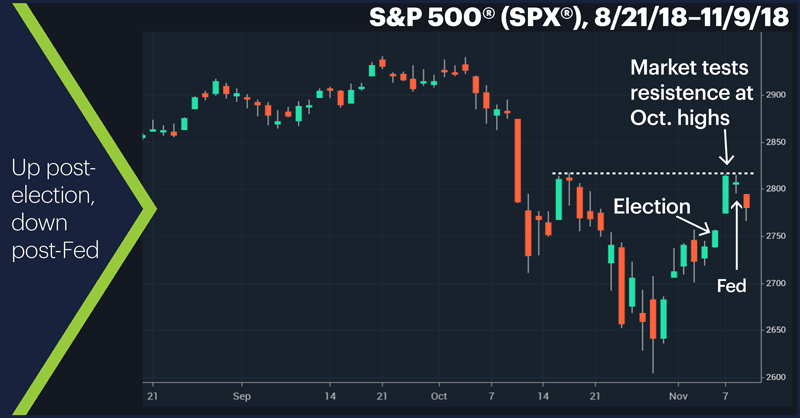 The S&P 500 (SPX) rallied 2.1% on Wednesday while the Nasdaq 100 (NDX) boomed 3% higher, overshadowing the week’s biggest piece of non-election political news: the firing—sorry, resignation—of Attorney General Jeff Sessions. The market gave back some ground Thursday and Friday, though—perhaps just a natural pullback after such a strong up move, but likely aided by the Federal Reserve’s Thursday afternoon announcement that laid the groundwork for a final 2018 rate hike next month (and more next year). The SPX’s rebound stalled right around the level of the mid-October swing high (chart above). Sector action: The top-performing S&P 500 sectors last week were health care (+4%), real estate (+3.6%), and utilities (+3.1%), the latter two jumping into their slots on a defensive shift during Friday’s pullback. The weakest sectors were communication services (-0.2%), energy (+1%), and information technology (+1.4%). Highlight reel: E-learning tech firm 2U (TWOU) fell more than 21% intraday after beating earnings on Tuesday, but rebounded nearly 7% Wednesday. And there was lots of action on Thursday in the wake of earnings announcements: TripAdvisor surged more than 15% on Thursday to its highest level in more than two years, Wynn Resorts (WYNN) tumbled 13%, and Scientific Games (SGMS) jumped 25% on Thursday before giving back a 9% chunk on Friday. Futures watch: While the stock market continues to attempt a rebound, oil keeps slip-slidin’ away: Crude oil extended its deepest selloff in more than two years, falling below $60/barrel for the first time since February. December WTI crude futures (CLZ8) ended last week with a 10th-straight down day, closing around $59.85. After pulling back early in the week, December US dollar index futures (DXZ8) staged a Thursday-Friday rally (in the wake of the Fed announcement) that pushed the buck back toward its 16-month highs around 97.00. Futures contracts expiring this week include November rice (RRX8) and November soybeans (ZSX8). The middle of November has been, on average, the SPX’s least bullish (but still positive) portion of the month over the past 50 years. (Also, the seventh and eighth trading days of November—Friday and today—are the only two days in the first half of the month with negative average returns.) 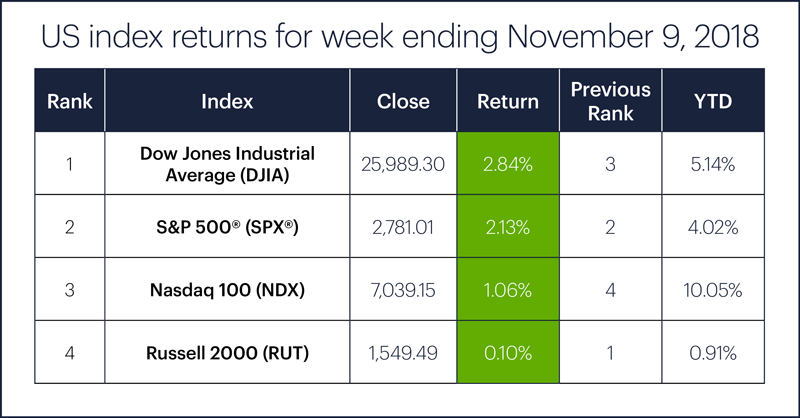 Historically, November has tended to kick into a higher bullish gear in the third week of the month.